“I don’t think there is any dispute that this prophesy is about as far off as one can get. If anyone can make an excuse for this or any of their statements (spoken as ‘apostles’ and ‘prophets’) then they need to check if they are in the faith”. 1. We learn that Dr Fluitt is referred to as ‘Bishop’ Clarice Fluitt. Faithful and discerning Christians know that, according to the clear instruction contained in God’s Word, only men are sanctioned by God to occupy the important overseeing role of ‘Bishop’ or ‘Elder’ in Christ’s Church. A portion from a short article on ‘Women Preachers’ that I have on file sums up the biblical prohibition quite succinctly as follows – It is clear that, in the 1st century, God placed certain restrictions upon women in many assembly and local church activities. But many brethren today are not content with 1st century proscriptions and want expanding roles for women in local churches in areas clearly designated as “Men Only”. The questions are (1) whether or not “we” or God have posted the “No Women Allowed” sign and (2) should these respective functions be respected or looked upon as curious instructions from another era that can be cast aside? The answer to these questions will depend upon whether one’s “hermeneutic” is objectively or subjectively based. From those restrictions set by God there should be no deviation and for them there should be no apology. And while it is true that some restrictions “we” have placed on women have more to do with tradition than Truth, let’s be careful that we do not rush impulsively into change and confuse the two. Women in pulpits and as elders in local churches are as foreign to God’s design for the local congregation as priests from the tribe of Judah would have been during Moses’ day and for the same reason: God specified from which tribe he wanted the priests to come (Hebrews 7: 11-14) and he has also been specific regarding the gender from which he wants elders and preachers. Cultural changes and all of the hermeneutical manipulation we might engage in won’t change that a bit. If the principles in 1 Corinthians 14 do not apply today and restrict women from preaching and teaching in our assemblies, then are those in chapter 7 regarding marriage, divorce and remarriage likewise to be ignored? And if we can somehow circumvent 1 Timothy 3: 1-7 and Titus 1: 5-9 and allow women to serve as elders, why can’t we ignore Paul’s charge in 2 Timothy 4: 2 and preach whatever message we feel like? ‘These facts are evidence of the apostasy of the hour. Men and women in the world, having rejected Bible truth, are confused about the most basic things… Sadly the church is always affected by society: thus the rebellion of women in the world is causing similar problems in the churches and we find women demanding leadership roles in many Christian groups. The Bible speaks too clearly on this subject for there to be any confusion… Men and women were made for different roles. The New Testament affirms that men are to be the leaders in the home, church and state. Women were not created to rule these divine institutions, men were… In the church, according to the Bible, no woman is qualified to be a pastor or deacon or in any other leadership position over men. Who says? God says! [1st Timothy 2:11-14; 1st Corinthians 14: 34-37]. How could a woman possibly be a pastor when she is forbidden to teach or to have any authority over men? Women can only be pastors if they openily disobey the Bible’s teaching’. Some of the immeasurable damage that can be inflicted upon the cause of Christ by scripture-defying female ‘Bishops’ is well illustrated by these two examples. 1. Posted to our ‘You Tube’ Channel there is a debate on the subject of ‘Gay Christians’ between a local evangelical minister and a female, lesbian ‘Bishop’. 2. On this ‘[Bishop Sends Shockwave, Slaying the Sacred Cow of Individual Salvation [Includes an online comic]’. Incidentally, this lesbian ‘church leader’, Candace Chellow-Hodge, featured prominently in my article from a few years back called ‘Philip Yancey: turning the grace of God into lasciviousness’. The foundation of the Christian church rests partly upon God’s revelation given through Old Testament Prophets and New Testament Apostles but supremely on the person and work of the Lord Jesus Christ – Paul wrote earlier in Ephesians 2:20 of “the household of God [that’s the Church] … built upon the foundation of the apostles and prophets, Jesus Christ himself being the chief cornerstone”. In a building you only have one foundation so today we no longer have apostles or prophets but pastors/evangelists/elders who preach and teach “the apostles’ doctrine” [see Acts 2:42]. 3. Finally from the Résumé we learn ‘she is fluent in all the gifts of the Holy Spirit… who continuously brings “revelation” from the throne room of God’. God’s ‘revelation’ ended with the ascension of the Lord Jesus Christ and the completion of His inspired written Word [see Hebrews 1:1-2 and Revelation 22:18-19]. Any claim today to fresh ‘revelation from the throne room of God’ is a violation of the great Biblical principle of ‘Sola Scriptura’ that was rediscovered at the time of the Reformation. When speaking on cults and false religions, one of the common features that I identify with them is that they have ‘an authority in addition to or in place of the bible’ – just by way of simple examples, people like Joseph Smith [The Mormons] and Mary Baker Eddy [Christian Science] claimed to have received such divine ‘revelations’ and these ‘revelations’ were foundational to the establishing of these particular unscriptural cults. 1. According to this section ‘In 1971, the late Kathryn Kuhlman laid hands and imparted a healing ministry to Bishop Clarice. Since that time incredible healings and supernatural power have been continually evidenced in her ministry’. Any claimed contact with Kathryn Kuhlman should be a matter of great concern for discerning Christians. ‘One of the most subtle actions of the Antichrist spirit has been the rise of the Charismatic movement. Only a few very discerning saints of God understood the “Charismatic renewal.” as they called it at its beginning. It appeared so harmless, even exciting, that the old line ministers and many Catholics were receiving the infilling of the Holy Ghost and revival was coming to multitudes of people. Being a Pentecostal since 1952, I attended some of their first Full Gospel Businessmen’s meetings. I wanted to be a part of anything God was doing. Never, not one time, did I sense a true move of God, but left every meeting where they claimed God was moving confused and troubled. The Spirit of God in me constantly witnessed that something was wrong, but I certainly did not understand what was wrong at that time… My experiences with the Charismatic world have been enough to prove to me the bankrupt foundations of this movement. The majority of the Pentecostal churches have been destroyed by this Antichrist movement within our midst. It apparently started with individuals like Kathryn Kuhlman. Our article entitled “Kathryn Kuhlman And Her Spirit Guide” proves beyond measure her foul influence. She was pro-Catholic to the core and started the slide within Pentecostal ranks in the direction of Rome. She was a guiding star to the compromises that later came to full bloom in Charismatic circles’. As a ‘non-Pentecostal’ I would not see ‘eye to eye’ with everything that Pastor Chambers writes but I do acknowledge him as a brother in Christ who has exercised helpful public discernment, not only with Kathryn Kuhlman, but also on matters such as the so-called ‘Toronto Blessing’ and ‘Pensacola Revival’ deceptions. This claimed connection to Kathryn Kuhlman should serve as a warning to avoid Clarice Fluitt! 2. Then according to the History of C.E.O section of Mrs Fluitt’s website we learn that ‘Bishop Clarice was ordained in 1982 through World Ministry Fellowship in which Kenneth Copeland and Hilton Sutton prophesied God’s favour and power over her’. Any claimed contact with Kenneth Copeland should be a matter of great concern for discerning Christians. However, what particularly struck me about this portion from the History of C.E.O section was the expression of how ‘Kenneth Copeland… prophesied God’s favour and power over her’. In the mid 1990’s when I was researching and speaking on the so-called ‘Toronto Blessing/Laughing Revival’ one of the main ‘players’ in that diabolical deception was Rodney Howard Browne – and guess who, in the run-up to that deception, ‘prophesied God’s favour and power over him’ – none other than Kenneth Copeland! By way of conclusion I want to refer back to the Todd Bentley influence that I mentioned at the beginning of this article. 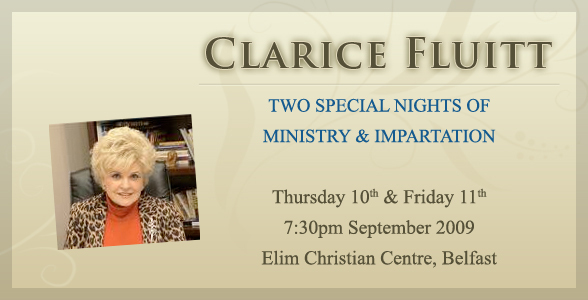 I have already mentioned Pastor Brian Madden who is in charge of the Elim Christian Centre that plans to host this visit by Mrs Fluitt. Pastor Madden personally visited the Todd Bentley happenings in Lakeland, Florida and subsequently invited one of the associate Pastors connected with those events, Bobby Sullivan, to come to Belfast to the Elim Christian Centre to ‘minister’ there. Pastor Madden was also personally and directly involved in claims that in a hospital in Belfast, a young man, a relation of one of the members of his church, had been ‘resurrected’ from the dead in the wake of a serious car accident. At the very end of this article I have also copied a current promotion from Mrs Fluitt’s website that again mentions the ‘Eagle’s Nest’ connection. The movie, ‘One Flew Over The Cuckoo’s Nest’ dealt with the bizarre and sometimes humorous goings-on in a mental asylum. 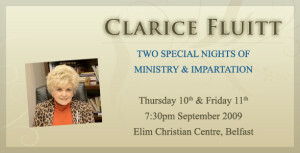 The likelihood of bizarre goings on, as happened in the movie, happening also when Clarice Fluitt starts to ‘minister’ in Belfast should not be discounted, but for sure, they will not be in the least bit humorous, as they will do nothing to glorify the precious name of the Lord Jesus Christ – these will be meetings most definitely to avoid! This entry was posted in Assorted Articles, Benny Hinn, Charismatic, Kenneth Copeland, Take Heed Ministries, Todd Bentley, Word of Faith and tagged Benny Hinn, Dr Clarice Fluitt, Kathryn Kuhlman, Kenneth Copeland, Todd Bentley on July 31, 2009 by takeheed.